It all makes sense once you know the team who worked on Assassin’s Creed IV: Black Flag worked on Assassin’s Creed: Origins. Which is to say: The reboot has been rebooted. After Black Flag’s sprawling Caribbean adventure, Ubisoft said it wanted to rediscover the “roots” of I the Assassin’s Creed franchise for its next installment, Unity. And laugh at Unity’s abysmal launch all you want (I certainly did), it accomplished Ubisoft’s goal. Unity brought the series back to the Assassin’s Creed II era, focusing on a single city (Paris) with enough towering cathedrals and palaces to let the reworked parkour mechanics shine. Then Assassin's Creed: Syndicate...did it again. But playing Assassin's Creed: Origins, I was struck by how much it felt like Black Flag—even before I knew it came from the same team. Abandoning the single-city conceit of Unity and Syndicate, the Egypt of Origins feels...well, like the Caribbean, oddly enough, but with shining cerulean seas replaced by figurative oceans of sand. There’s a lot of empty space in Egypt. Specifically, there's a lot of empty space in Ptolemaic Egypt. Origins is also the first mainline Assassin’s Creed game to rewind the clock, jumping us back from Syndicate’s Victorian era to the days of Caesar, Pompey, and Cleopatra, around 45 B.C.E. That puts us in the time of the Egyptian and Roman civil wars, with Caesar all-but-destroying the Roman Republic and Cleopatra trying to take down her brother and rule Egypt. 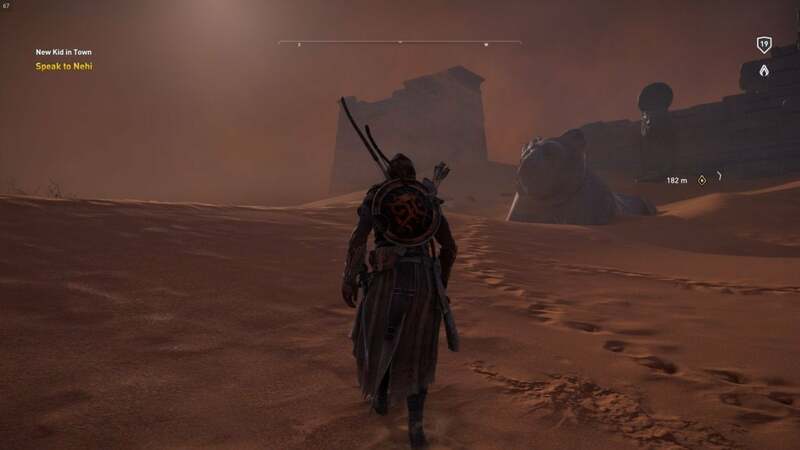 You’re but a small player in these events of course, taking over as Bayek, a “Medjay,” or person tasked with protecting the Pharaoh's interests. 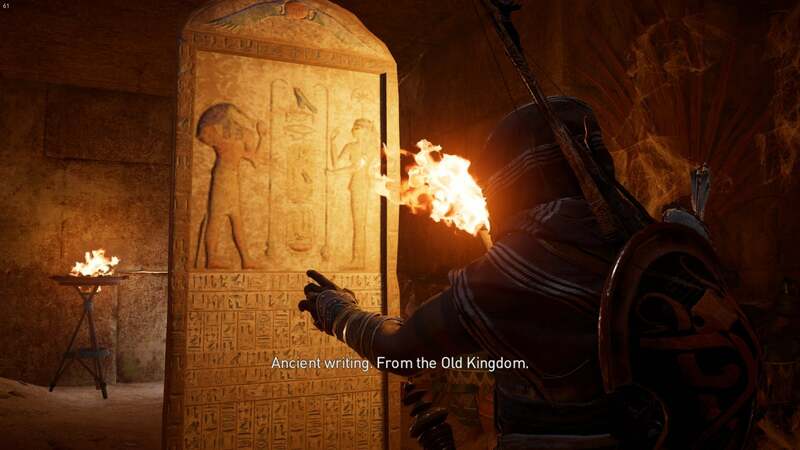 And like most Assassin’s Creeds, Bayek’s personal mission of revenge soon expands and brushes up against the interests of those larger historical figures. The story is the point where this review is the most “in progress,” I’ll admit. I’m maybe halfway through it and so far not too impressed—Bayek is charming, but he’s no Edward, and his self-serious “Good Person” routine grates almost as much as did Assassin’s Creed III’s Connor. He’s just Very Righteous, and I mean that in the “lawful good” sense, not the psychedelic one. Missions vary in quality drastically. Some blossom, small events spiraling into larger and larger sequences until a mission that began with a single cast-off bit of papyrus has you delving into forgotten tombs. And then, high on the adrenaline from the last mission, you start another and a guy is like “Hey, go play hide and seek with my kids” or “Go grab my scroll from this generic bad-guy lair,” complete with terrible voice acting. There are some interesting twists on the formula, plus a few good callbacks in the prequel-sequel mold, but so far it’s the setting that’s pulling most of the weight. The Library at Alexandria has yet to be burned down, and the famed Lighthouse of Alexandria (one of the ancient wonders) still stands in the harbor. The Pyramids (another wonder) are starting to show signs of decay, but are still gleaming white for the most part, capped in gold, thousands of years old but still resplendent mausoleums. The Great Sphinx even has its nose intact—and is painted, in the ancient tradition. I love it. One of my problems with Syndicate (and with Unity to an extent) is that the closer we get to modern-day, the less different everything seems. Many of Unity’s landmarks exist today, as do an even greater number of Syndicate’s. While it’s quaint to see London’s streets filled with horses, hand-drawn signs, and Dickensian characters, there’s a familiarity. But part of what drew me to Assassin’s Creed in the first place was its willingness to explore settings most games ignore. 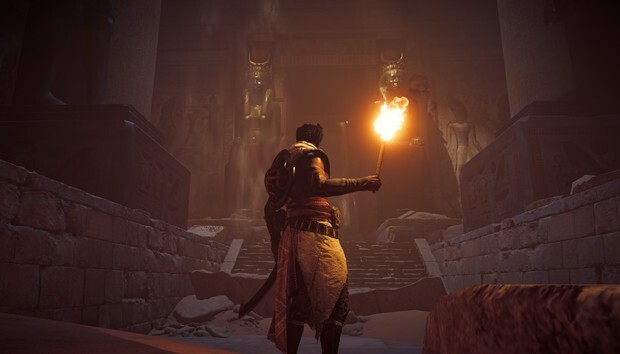 Origins succeeds admirably in this respect, recreating most of Egypt as it existed in the mid-40s B.C.E., from the flooded banks of the Nile to the Hellenic streets of Alexandria. It’s a marvel to just wander the world, climb the pyramids, hang off the Sphinx’s face, and so on. Living history. A sidebar about microtransactions? Saying that spending money will "enhance" the game? Ugh. Unfortunately to create this sense of scale—well, as I said there’s a lot of empty space. 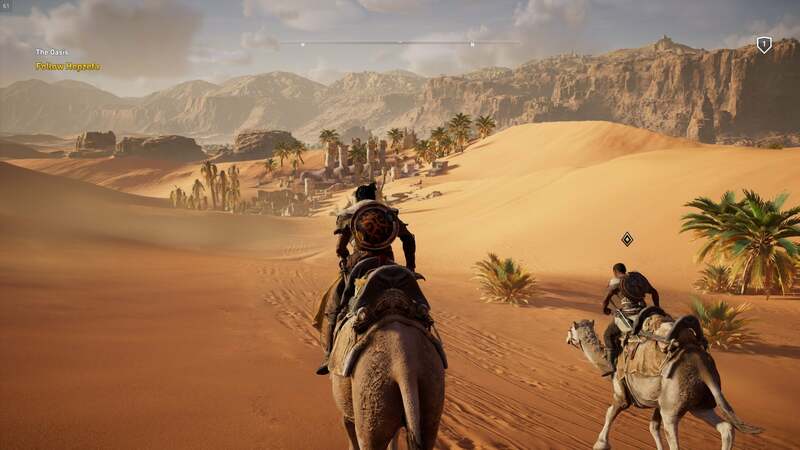 Origin’s Egypt is made up of important points of interest surrounded by nothingness, much like Black Flag. But unlike Black Flag where sailing was an engaging experience all its own, with pirates singing and one eye always on the horizon scouting for enemies, Origins is just you riding your horse across endless deserts. It’s boring. 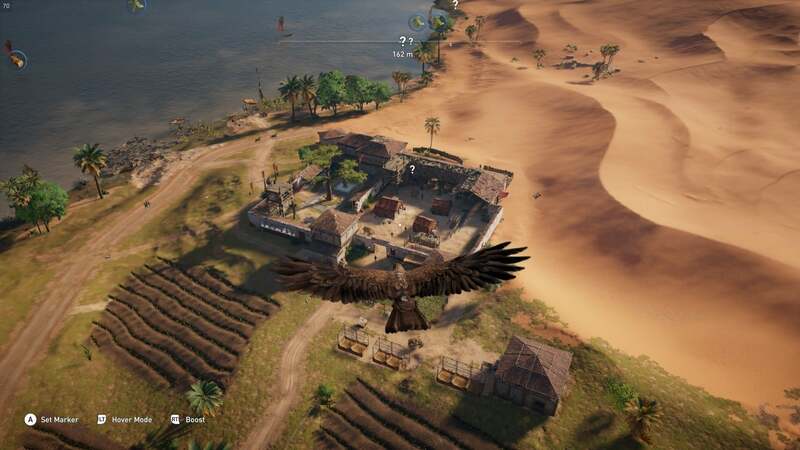 Boring enough that Assassin's Creed: Origins even provides an auto-pilot button. Set a marker on your map and your horse will ride there on its own, no input needed. At one point I routed to a distant tower, set the controller down, got up and grabbed a drink, checked on my dog, came back a minute or two later, and the horse was still going. And it wasn’t like I’d picked a point across the entire map or something—this was a tower in the adjacent province. Seriously, just let the horse AI do the work. Worst of all is that many locations exist solely to provide fodder for side quests, which hampers your motivation to explore. After all, you don’t want to clear out that cave, then end up back there 30 minutes later to clear it out again because someone demanded it this time. The scenery is pretty though. Empty as it may be at times, the rare oasis in the desert or a crush of palm trees leaning over the Nile make for a gorgeous backdrop. 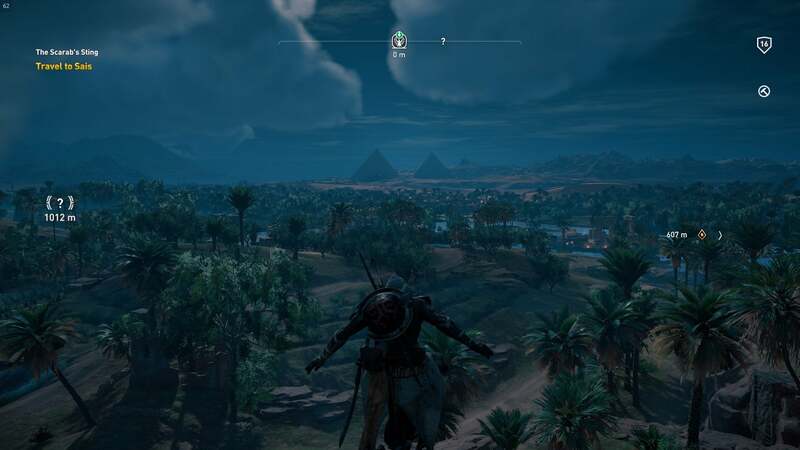 Sight lines are also amazing on the PC—seeing the pyramids off in the distance never gets old. 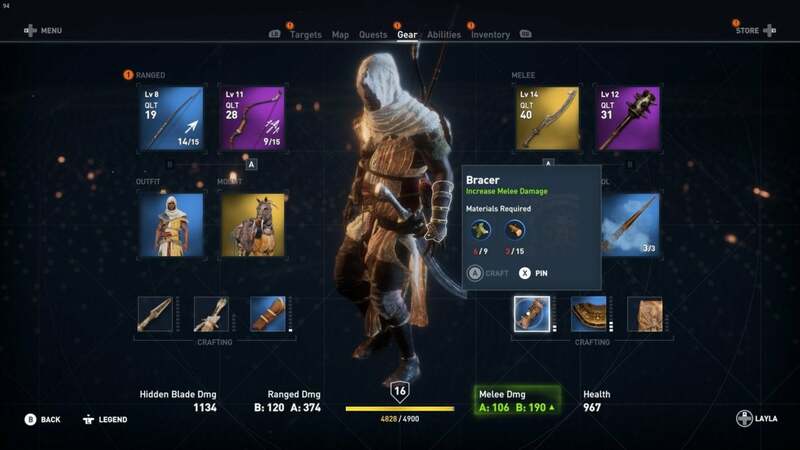 Aside from returning to a Black Flag-era emphasis on exploration, the other major change with Assassin's Creed: Origins is its combat. The entire control scheme has been reworked to emphasize it. You now have a light attack, heavy attack, and a shield, plus a bow attack and a dodge-roll. Weapons also come in a bunch of different variants, from standard swords to dual knives to poleaxes. It’s the most complex Assassin’s Creed combat has ever been, though in practice it still mostly involves dodging around the nearest enemy and hitting them a bunch. There’s also an entire RPG system. 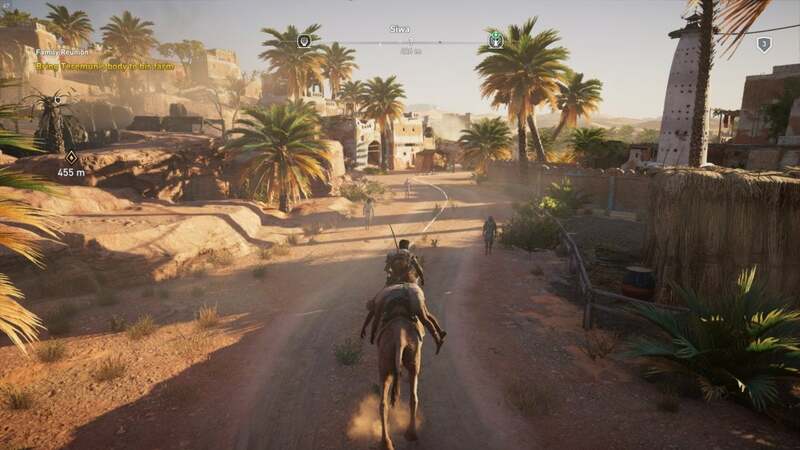 Bayek levels up, and the map is broken into regions based on level—reminiscent of Ghost Recon: Wildlands or The Division. I can’t say I love it. It’s a decent first attempt, but I think whatever follows Origins will be more refined. Leveling hasn’t been too arduous but the new skills you get just aren’t that interesting (being mostly things you acquired over time in previous Assassin’s Creeds). You’re also forced to search for new gear or upgrade the gear you have, because you need a sword that does damage appropriate to your level. Like The Division though, gear is all pretty interchangeable, which diminishes the appeal. What, you want more evidence of Ubisoft’s cross-game homogenization? How about the fact that you now have a pet eagle who functions like the drones in Watch Dogs 2 and Wildlands, scouting objectives for you and tagging enemies? No, seriously. Sync towers barely even do anything at this point, as most scouting is done by your eagle. And with combat taking center stage this year, it’s the series’s trademark parkour that suffers. In fact, Assassin's Creed: Origins often gives off the impression it couldn’t care less about climbing—another aspect that reminds me of Black Flag. The more nuanced controls of Syndicate and Unity are gone completely. Now you just press and hold a button to climb, often without even needing to actively look for handholds. Bayek can seemingly scale even flat walls. It’s a bit of a shame, though I can’t exactly fault the decision—there aren’t many tall buildings to climb in Ptolemaic Egypt, and as with Black Flag most of the game will be spent on flat ground or scaling buildings two stories tall at most. A quick note on performance, before this overlong review wraps up: It’s pretty good! With everything maxed out at 1080p on a 6-core Intel CPU and a GeForce GTX 980 Ti I’m getting between 45 and 70 frames per second, which to be honest is higher than I expected—as I said above, the draw distance is incredible at times, and being high up in the air is where I see it drop to mid-40s most often. Alexandria is the other—lots of people walking around, lots of buildings, and et cetera. Dropping down a level in the graphics settings gets me a smooth 60-plus FPS the whole time though, and the difference isn’t too noticeable. Check out that draw distance. I also haven’t run into much Unity-style bugginess, though we’ll see if that changes. 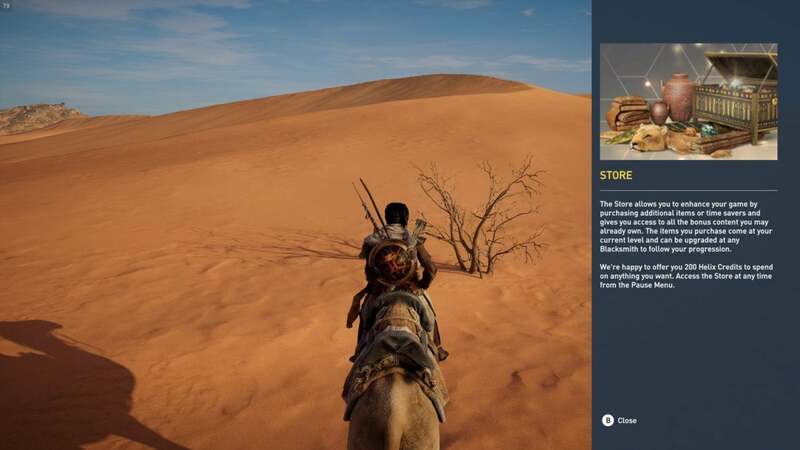 There are a few problems—quests that didn’t trigger correctly, and a tendency for Bayek to get stuck on scenery or climb an object and struggle to get back off. No real game-breakers though. Again, I’ll keep you updated if I start seeing a rash of complaints once the game’s properly released. Really I just expected more to change, I guess. With Assassin’s Creed taking its first year off since 2008, I thought we were in for a wholesale reimagining. Origins gets us maybe...a quarter of the way there. Better combat, better setting, better-ish story—what’s here is more interesting than Syndicate, but mostly because of a pivot towards Black Flag-style design. We’ll see what next year brings.